You are currently browsing the The Pet Product Guru blog archives for the day Thursday, May 17th, 2018. Did My Cat Do That? Most cats are sort of boring creatures. They eat, poop, sleep and once in a while they rub up to you and ask for a pet or two. 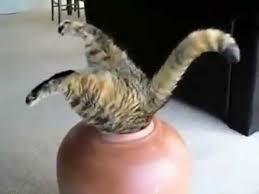 Cats can also perform amazing, unexpected antics. One time several years ago, my cat Mollie decided that she wanted to be on the radio! I run an internet radio station and when I lived in New Jersey, I connected a very small FCC approved AM transmitter so I could hear my station around my apartment complex. One time, as I was getting in the car, I heard music playing, I then suddenly heard my cat Molly meowing and singing to the music! It was quite comical. apparently, she figured out how to open the mike by pressing a button down with her paw. I also had to remove my Bose radio from my nightstand. When Molly, wanted me to get up, she would jump up on the nightstand and gently push the “on” button to turn on the radio. She would then keep her paw on the button until the music reached a level to shake the house and shake me and my neighbors out of bed. I miss my Molly, she was a very special cat. I’ve also heard of cats that can open doors, and even change the time on the clocks around the house! I believe that our feline friends have some kind of hidden intelligence that only comes out when they require attention. My cat Millie meows in my ear when she wants her snacks. She doesn’t like when I change the water in her fountain. She sits at my feet and meows while I’m cleaning it as if to tell me to hurry up and put it back! Enjoy your feline friends, they are amazing, intelligent creatures! Great music plays all the time on Edgewater Gold Radio! Oldies from the 50s 60s 70s 80s and great pop standards play all day! Download the free Edgewater Gold Radio app or listen from our website, edgewatergoldradio.com. add comment Comments Off on Did My Cat Do That?